Our spring trip will be MAY 17-19! Monday, April 22 through Sunday, April 28 ONLY. Please click here for complete registration instructions. Each season, we offer optional weekend camping trips, which are open to all. Though you do not need any prior experience with us to attend, these trips are a nice extension of the after-school program, promise a memorable time and are a perfect trial for those who have not had much "sleep away" experience. Each trip has been a huge hit - previous participants continually rave about them. 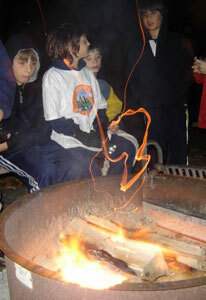 Among the included activities (weather permitting) are canoeing, fishing, hiking, sledding and evening flashlight games. We generally travel about 2 hours outside of the city to Stony Acres in Marshalls Creek, PA (fall and spring) or the Fresh Air Fund, Sharpe Reservation in Fishkill, New York (winter). We sleep in rustic cabins, which are heated in winter. Participants learn handy wilderness tips and tricks, including how to build a campfire (though we cannot guarantee a magic fire like this one!). We definitely roast marshmallows and enjoy s'mores! These trips are for girls and boys, ages 6-12. If your child is younger and you feel she or he is ready for a trip like this, just contact Mike to discuss it. There are always two instructors, regardless of enrollment (the staff-to-child ratio is at least 1:6). However, the minimum number of participants needed in order to run a trip is 7. Depending on enrollment, our usual method of transportation is via school bus or passenger van. We meet on Fridays at 5:00 p.m. and return at 2:00 p.m. on Sundays. We have a wealth of weekend trip experience involving kids within this age range and you can rest assured knowing we are proficient in managing occasional bouts of homesickness, as well as whatever else may come up. The Explorers usually have so much fun that the jitters, if any, are gone once we set up and get into our routine. However, if a child needs to speak to a parent, he or she will be able to. Please click the links below for the enrollment form, more information about the campground, to keep tabs on the weather in the days leading up to the trip and for a complete list of what to pack. As with anything, please contact Mike with any questions, comments or concerns. Space is limited, so before registering, please be sure your child is ready for a weekend away from home and that the dates definitely work for you. We will issue a full refund for cancellations up to seven days before any trip. After that, the enrollment fee is non-refundable with less than seven days notice, regardless of the reason for withdrawal.